Remote working is becoming a feasible reality. It is pervasive throughout the start-up world and is becoming more common in the corporate world, too. However, despite increasing opportunities to pursue such a set-up, many individuals resist taking the plunge because there is no formalized structure for doing so. “How the heck will I organize and structure myself, working alone in my house? Will I lack discipline and end up taking naps all day? How can I run my life like a business?” The reality is that there is no “template” for independent work. It’s not a career option that most of us were raised to consider or formally studied (although, luckily for the next generation, organizations like Kidpreneur.com are teaching entrepreneurship beginning in elementary school). In my work as a freelance consultant to start-ups, I’ve had to create structure for myself. And while I don’t purport to have all the answers, I’ve developed a framework that I hope can benefit you, too, whether you are already working independently and/or remotely, or considering jumping ship and just need a little guidance. The key for me is balancing my personal life with my professional life. Here are the 10 guidelines that I have developed for success as a remote worker. Set your alarm clock. Wake up at the same time everyday and "get online" (i.e. get to the office) by the same time, too. The routine will help you sleep better and wake up faster. Bookend your days. Reserve space in the mornings and in the evenings for you. Don’t feel guilty about it and try to stick to the timetable. If you love what you are doing, you’ll end up working more, so it’s important to make sure that you take care of yourself. In the mornings, I take my time getting ready, make my oatmeal, sit in the garden with the dogs and breathe fresh air. In the evenings, I close my laptop, go for a run and commit to staying off social media. Get out of the house in the mornings. I like to travel by bike or by foot to my working destination so that I can separate home from “work” and let my mind settle into the zone. Leave your phone at home. When I have projects requiring me to think and analyze, I try to sequester myself outside the house and remove distractions. I like working from a café with a big table and I’ll bring earplugs and leave my phone at home. Committing to just 2 hours forces you to be productive and you can also reward yourself with a smoothie or snack of your choice. Seek out a support network. When you leave the corporate world, there is this sense of elation from escaping “the man.” But the reality of independent work can be lonely and you soon begin to realize how important it is to have colleagues working towards the same goals. I’ve built a great support system by surrounding myself with other entrepreneurs: I started a women’s entrepreneur group in Miami and am a member of Dreamers and Doers, the NYC based women’s entrepreneur group. Many people also benefit from joining a co-working space. Integrate systems to help you manage projects and get organized. Asana and BaseCamp are project management tools that allow you to input all your projects and then intuitively organize, elaborate on and calendarize them. Evernote is great for storing information (meeting notes, to dos, clippings to read later) and calendarizing it so it doesn’t get lost in your black hole of email archives. Get to know your colleagues and clients. No matter what type of business you are in, you will always be working with people. Before launching projects, conduct a "meet and greet"- effectively like a welcome lunch. Share bits about yourselves personally, so that you can start to build rapport and comfort level. Communicate about communication. Everyone has different personality traits and working styles. When you are working remotely, these boundaries become more important because it’s so easy to unintentionally overstep them. Before you begin working on a project, make sure to define each party’s preferred communication medium (email, phone, text, Skype, other), working style (fluid and easily accessible or compartmentalized and requiring scheduled contact), management preferences (some people are motivated by negative feedback whereas others are motivated by encouragement) and timing boundaries (some people are early birds, others are night owls, and team geographies could be time zones apart; set up a standard to which everyone adheres). Schedule regular check-ins. Set up at least one meeting per week with your client/boss to review, plan, and communicate feedback. It can also be helpful to set up bi-monthly meetings with peers in other locations to build team cohesion and stimulate new ideas. Integrate team communication tools. I personally think it's important to integrate video communication such as Skype, Google hangouts or Microsoft Lync because they make the office seem more real. Forget about whether you need to brush your hair - so does the person on the other side! Tools such as Slack can centralize information flow, kind of like a super-charged communal email that’s actually kind of fun! These types of tools promote collaboration regardless of employees' locations. As with anything else in life, success as an independent and/ or remote worker comes down to creating and implementing systems. Do you have any systems that work well for you? Please share! Let’s empower each other to take the leaps of faith in our careers that can lead us to long-term fulfillment. These are some great advices! Thanks for sharing! Me too! Hi Laura, do you also work from home? Great to hear how you get organized! I like to have an office where I will put my things and by the end of the day I will just leave them behind to get back into my "home". Do you do that? Hi Stella, I do think it's important to delineate between "work" and "home," even if you live in a small space. It's helpful to mentally prepare yourself to "go to work" even if it's just for a few hours of the day so you can commit yourself to productive time. One idea would be to set a stop watch to enforce some discipline. You could try an app like Toggl. Then, when you take breaks, make sure to fully enjoy them, for instance making sure you are totally present (not on social media whittling your precious free moments away). I find that I can often be productive by eating a light meal, then working straight until the next meal, at which point I take a break. Great insight, Avery! So, are you working from home? For how long now? Do you have any children that you have to take care of? Thanks! Yes, I work remotely, so I either work from home or from cafes. I have had this set-up for the last 3 years. I don't have any children but I'm sure that would add another layer of complexity for time management and focus. Do you have children? What are some of the challenges you face with regard to balancing kids with work? Thanks for the feedback Avery. Yes, I have children. So, it was quite messy at the beginning, then, I came to realize that I should do as if I was not at home (while being at home), meaning that I will go to another room while having the kids play in the other room until my breaks or until I am done. We usually take lunch together. It was hard at some point but this new discipline helped make thing smoother. Have you heard of anyone's else feedback who has kids? Yes, that segregation can be useful- it's setting of boundaries that your kids must respect and you must respect, too. Kids usually respond well to boundaries because it makes them feel safe and structured, so you'll be doing everyone a favor. Some mothers choose to hire a nanny or rely on their partners to care for the children during periods when they need to be focused. Hi Lucy, yes I work for myself. What about you? What did you retain the most from this article, Laura? Thanks for sharing! I am working from home now and feel that I ma more busy than ever before. Thanks for any suggestions or feedback, Laura! Incredibly helpful advice! Learned a lot from you, Avery. Me, too! I also learned a lot from this post! Awesome! Feel free to ask other questions if there is anything specific you a wondering about. Hi Gesche, do you also work from home? I love this. Will be great to hear how you get organized! What did you find the most important skill in working from home? Thanks for your question, Jane, and it's a great one. I think that boundary-setting is very important. 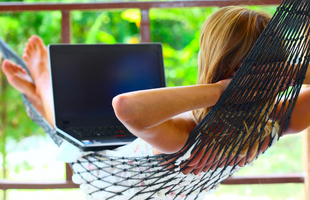 Many people choose to work from home because they want the freedom that comes with it. But once they have the freedom, they aren't sure how to structure themselves. Everyone is different with regard to the ways they enforce discipline, so your method is likely to be individual to you, as mine is to me. Since there's no one right way to structure yourself, what I'd suggest is setting up a plan of attack for exploring your boundaries and make notes in a journal about what worked for you and what didn't. For instance, you could monitor how good you feel given the time of day you woke up and went to sleep, size and content of meals you ate and how they impacted tiredness or energy, time of day you are most productive and locations where you are most productive. You can also make notes about what distractions are the biggest culprits. Observing yourself is a great way to become conscious of what set-up works best for you so that you can build a schedule that fits your groove. Personally, I know that I need to be on my laptop by 9am and if I delay at all I am likely to slide into distraction land. I also know that I distract myself by going on Facebook and playing with the dogs. So, I try to get up early and get out of the house so that I don't have the temptation of the dogs, start work by 9am and actively monitor how much time I spend on sites like Facebook using a tool called RescueTime; the free version lets you monitor your usage of productive versus distracting websites and the paid version has a cool feature that lets you block your own access to certain distracting websites for defined periods of time. Great suggestion, Avery! I have to be honest at some point in time I had come to realize that I was becoming a mess working from home. Waking up early and started to do email in my sleeping cloth, forgetting to exercise because emails kept coming up, and then when I looked up at the clock it was already noon, grabbing some lunch at the desk before I realized that I had not brushed my teeth yet...You see the whole mess? Hi Jane, sounds like you need to come up with a plan that you think will work for you and then practice with it for one week. When I have busy periods at work I have a rule that I have to shower, get dressed and get out to a coffee shop before I allow myself to check emails. Also, if you set a timer (max 30 mins) for your emails, it will make you more cognizant that you need to be quick. Great advice, Avery! I have come to realize that having some structure and a lot of discipline is what will be needed before we can really enjoy working from home! Yes, it is also great for me. I like to have an office where I will put my things and by the end of the day I will just leave them behind to get back into my "home". Do you do that, Gesche? Thanks for your feedback! Glad to have been able to impart some new ideas to you, Gesche. What did you like the most from this list of advices? Wow, this is great advice! Thanks Avery! Your welcome, Lucy! I hope you can take some of these tips and build them into an ever-productive work life. Avery Roth is a career change coach. Citizen of the world, wellbeing enthusiast, and former banker/photographer/strategy consultant. 5 languages, 3 continents. Hailing from the city that never sleeps! helen and 14 others upvoted this.